All equipment is selected upon a quality to value ratio weighted towards exceptional quality & superb value. We're proud of what we sell... Unlike big box stores, we offer personal service & no hassle sales. SPENDOR A2 $2595/pr. Stunning accuracy & musicality." POSITIVE FEEDBACK 5/18 6” woofer & 1” silk dome; 150W; 85db eff. ; 30x6x10”; 36-25k; 8 ohm, real wood veneer: walnut, oak, black ash. SPENDOR A4 $3495/pr. Oozes quality through & through." HIFI NEWS 7/18 7.2” woofer & 1” silk dome; 200W; 86db eff. ; 32x6.5x12”; 34-25k; 8 ohm, real wood veneer: walnut, oak, black ash. 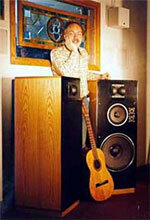 For over 50 years Spendor has hand made quality speakers in England. Spendors are known for outstanding imaging & revealing midrange. They are easy to set up & power. Copyright © 2001-2009 GoldSound, Inc.
We have many used turntables & new cartridges, stylus and needles. We don't have a date set just yet. Please call or email, if your interested in attending.